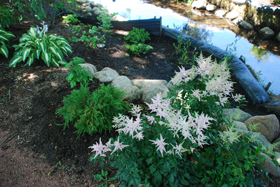 Kids Creek is a major tributary to the Boardman River, which supplies 30 percent of Grand Traverse Bay’s surface water. Kids Creek is on Michigan’s Impaired Waters List due to sedimentation caused by heavy runoff. The buffer will help reduce runoff, absorb pollutants and protect Trout habitat. 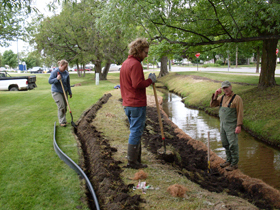 The Grand Traverse Conservation District was a project partner; Steve Largent supervised installing fish habitat structures and stabilizing banks. Several volunteers helped with plantings. The Munson design team built bridges over Kids Creek. McManus also explains that the buffer garden is an important part of “the healing process for patients and their families.” Not only does the buffer help improve local water quality, but it’s a place of solace and outdoor recreation for patients. We can help heal our Up North waters, and they can help heal us.